Ditch instant and brew something better-anywhere. The Kuju Coffee Pocket PourOver coffee is an on-the-go, drip coffee filter that anchors to your mug with small-batch roasted coffee inside. Ditch instant and brew something better anywhere in 3 - 5 min. with the Kuju Coffee Pocket PourOver. This on-the-go, drip coffee filter anchors to your mug with small-batch roasted coffee inside. Never miss your morning ritual. 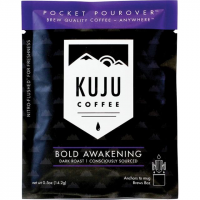 Enjoy quality coffee wherever you wander with the Kuju Coffee Single Origin Pocket PourOver coffee. There's no fancy equipment needed-just your mug!